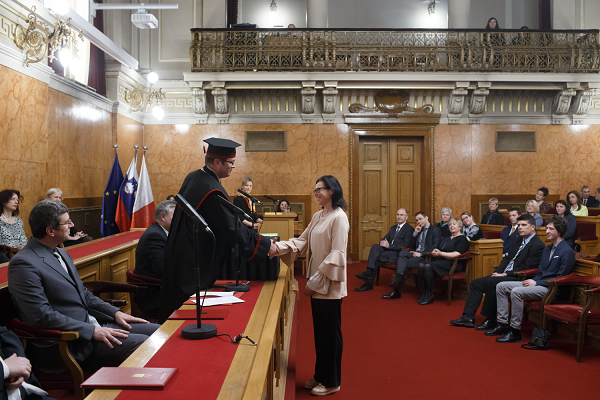 Biotechnical Faculty honoured Prof. Dr. Damjana Drobne by awarding her Jesenko Prize in order to recognise her lifetime achievements. In particularly, her implementation of a new line of research; e.g. nanobiology and nanotoxicology, was honoured. Also, her contribution to doctoral studies at the Biotechnical Faculty is highly appreciated. Prof. Dr. Damjana Drobne is by no doubt a renowed researcher, both in Slovenia and abroad. Read more about the event at the Biotechnical Faculty’s webpage. Photo taken by: Željko Stevanić, IFP d.o.o.